Working with Serapis Bey: I was told about 20 years ago that Serapis Bey was one of my ascended masters in a reading. I bought a book about him, but never really got into it. I would love to have another look at it now, however it seems to have entered an alternate reality and I presume it will show up when I am ready or have time to read it. I really never felt a strong pull to work with him and felt that I was perhaps sensing a different energy. It was only in the last few weeks as I am finishing off the content for my new book that I felt compelled to work with this wonderful master, and what a treat it is. He is very refreshing to work with. I didn’t pick him, he picked me as I just asked what other masters I should include in the book. I actually didn’t even realise he was a part of the seven rays as he is the ascended master of the 4th Ray according to the Ascended Masters I AM and Alice Bailey’s teachings and the 3rd Ray according to Ronna Herman and Archangel Michael. Serapis Bey did share with that there will some changes happening over the next few years as we begin to work more with the twelve rays, there will be changes to which master or archangel is working with that ray. He also shared with me that the twelve rays will see female masters like Mary Magdalene and Quan Yin coming forward as they too are wisdom keepers of transformation for the coming age and it is time for a balance of the masculine and feminine. Serapis Bey works on the 4th Ray of Harmony and Balance. Emerald green is the colour of this ray. He also works amethyst and violet. He appeared to me in a temple within a pyramid at the temple of Luxor and told me I had several lifetimes in Egypt and will have a spiritual experience when I return. He has a very calming presences and is a more subtle energy that some of the Masters. He has a gentleness that is very soothing. Crystals to work with can be Diamond, Pearl, Zircon, and Quartz. 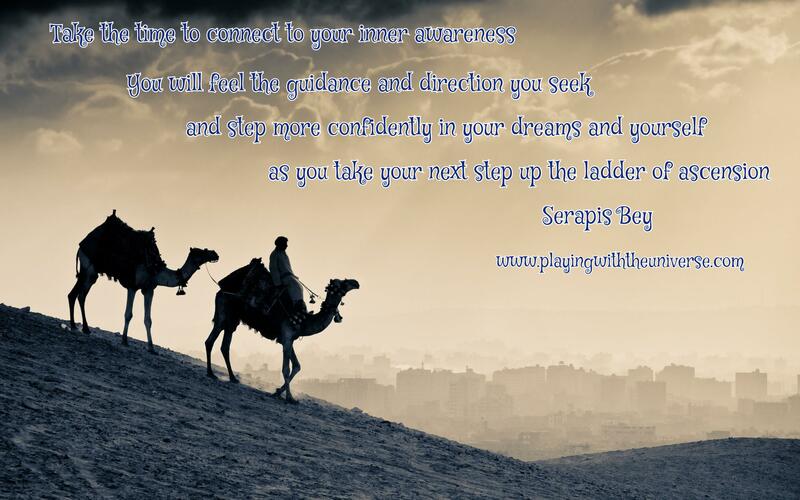 Invite Serapis Bey to overlight you as you are processing shift symptoms, or for guidance and understanding. He works with Archangel Gabriel on purity, discipline and joy. I am honoured and happy that you have called upon my energy to work with and help you understand the process of ascension and reawaken your energies of remembrance. We have lived many lifetimes together and you will feel a familiarity with my light. Journey with me to the temple of the masters and receive an initiation to the plane of the higher mind and of spirit, turning knowledge into wisdom and the ability to use the spoken word to teach this higher dimensional way of being to those that follow. Always the student becomes the teacher, the aspirant becomes the master. You must find the space and quiet to connect and communicate with your inner guide for you to see the results that you seek for yourself and your world. Of course it is always a choice, however if you are confused or indecisive, it is because you do not have enough information to go confidently, or you do not trust yourself or your journey. Both of these are easily remedied. First, do some research or seek expert advice to help you make your decisions. Your computers make this so much easier as you literally have the answers at your fingertips. Discernment is also a quality you should develop and that will come as you learn to trust yourself again. The second one is trust. This is something that must come from within you and it is not about trusting others, that’s discernment, it is about trusting yourself and making confident decisions for yourself. Your guides and angels are leading you towards the answers that you seek. Remember to listen to and follow the steps we are communicating to you through your thoughts, intuition, day dreams and night dreams. When you are making decisions for your life, ask yourself, “Which choice brings me closer to my divine purpose and service, and which way takes me farther away?” You will know what to do, to choose what is best and right for you. No one else can decide this and let no one try. Keep charging ahead. Victory is yours. Your hopes and your dreams will manifest as long you keep your focus positive, and on the prize. It is so very important for you to believe that all things are possible and not put limits on your creations and desires. This is often where the human gets all turned around and confused about what to do and where to go. When this happens, take time out and take a breath. Release the how’s and the what’s and just believe that it is going happen regardless. Do not let others or your own fears hold you back from taking the steps you want to take. Much of your wanting stems from the mental body and it takes the world of the physical, emotional and etheric bodies to really make things happen in your reality and as you approach life and your dreams from a balance of these bodies as well as the mental processes, you will then be in the flow of energy for your life. Let not the commercialism and fear based energies interfere with your creations – these are of the mental concept of scarcity and lack and are often the blocks that stand in your way. Transform your thoughts and get them working with you and for you. Ascension is about you becoming an empowered people. You will move away from the paradigm of power over to understanding that you are truly more powerful when you work together. Remember that it is safe for you to be powerful as you know how to use your power in loving ways that assist others as well as yourself. As you continue your journey to unity consciousness, you will grow in many ways. Right now it is mostly learning love, forgiveness and how to be more compassionate beings and much has happened on your plane in the last days to help to exemplify this to the people. To help you heal any situation, allow yourself to see it from everyone’s perspective and with the compassion of the higher mind and heart. Weight all points of view and ideas carefully and then you know that you are doing what is best for everyone and that must also include you as you are also an important part of the whole. Ask yourself “What is most important to me right now?” and let the answers flow from your heart and your mind blended together as one. Take the time to looks at things again, as you have shifted and changed who you are so much of late, that a new perspective is necessary from the aspect of all four bodies, the physical, emotional, mental and etheric, and to take care of yourself in all of these ways. We cannot emphasis enough that is so important for you to look at yourselves and your life from the four perspectives. Diet and movement are an important part of the ‘physical’ journey and to realise that your body is the temple, the vessel of which allows your spirit to express itself and must be cherished. There is much miss information about what is good and best for you and this where discernment and a good healer are helpful. Your allopathic doctors have much to offer too and hopefully will begin to question more as they see the energy and holistic healers getting results where they cannot. Until then, it is up to you to learn and understand that there is so much more available to you and so learn what is right and best for you. Treat your body like the god/goddess that you are and know you are worthy the journey of good health and it is a natural state of being. Your purpose is important. There is not just one goal or purpose for your entire life; however you usually choose a major theme. Feeling you have a purpose is important and each one of you is a thread in the weave of life, if one of those threads should break, then it is no longer as strong and whole as it once was and we must find someone to mend it and make it strong once again. If you are unsure of your purpose, ask your angels and guides to put you in a place where you can be your highest and best use to the Universe and All that IS and allow yourself to serve a purpose and yours will come to you. If you feel unsure or afraid, confusion or perhaps anger, ask your angels to help you heal your emotions and release these feelings from your heart and your mind that which feels discordant. Trust in yourself as we trust in you and you will get where you want to go. Don’t allow insecurities to hold you back, as you have dreams worth aiming for. Focus on the now and let your angels and guides do their work setting things in motion for you it in the what is to come. Find the balance in your emotional selves by realizing it is okay for you to feel emotions in all of its beautiful forms whether you are engendered as a male of a female. It is when you understand that you need the blend of both within you to really get things done that you begin to process the aspects of each in your lives and things begin to change. Find that balance within and you will feel both the energies working for you and with you and will feel whole and complete within yourselves. Let this be a loving teamwork of internal forces that allow you to be a powerful external force. Creating a meditation practice that fits with your life is of the utmost importance. It is when you feel disconnected from your inner wisdom, your god, or self that chaos ensues. It does not need to take long or be difficult and it is part of you becoming the self-masters that you are becoming. Great wisdom comes from spending some time in solitude, in nature, just going within and connecting to that clear and quiet wise center within your sacred and high heart. Trust that you have the talents and skills you need or will easily be guided to a teacher to assist in your spiritual practice and the changes you are longing for will manifest in your world. Change is happening all around you and within you. You are creating a bridge to transition from the energy of the old ways to a grand new way of thinking and supporting each other. Each catastrophic world event is an opportunity to find love for each other and support each other so that these stop from happening. It takes just one person to make a difference and like the domino principle, the old paradigm collapses and a new one must be built with a new firmer foundation upon which to stand. This will happening globally as within the awakening ones. Take the time to reflect upon where you have been and what you have learned from these experiences as it is time to become the masters of your destiny. For some of you this can mean a complete change in your life, the universe and everything, new careers, new jobs, new homes, new countries… something completely different than what you had before. Try something new or completely different and see if it leads you to a better place than you were in before. Be brave and trust your heart. Purposeful action leads you closer to you wants and needs faster than other process. Keep your thoughts positive and focused and know that you are deserving of creating this. Support each other. Release judgement and replace it with assessment. Be at peace. Inner peace helps you create outer peace. As you find the balance and support within yourself the world around you changes. As each human steps forward and finds peacefulness with themselves and their world, their world changes. Soon you will see the changes you have dreamed of for so very long happening on a global level. Do not wait to see what others are doing, do it now and do it for you. Each day is a new beginning and a new opportunity to find a better way. Each day is a fresh canvas upon which to paint. Decide that today you will a great day filled with surprises from spirit to make you laugh, to enjoy, to step closer to creating your dreams and desires and that each step you take helps you move forward on your path. You can choose to be peaceful inside you regardless what is happening around you. Caring for yourself is one of the most important actions you can do right now. To create the rewards, expansion and destiny you seek for yourself and your world is to take your power back and use it with the balance and love you have elevated yourself to already and you will feel more positive, sure and able to focus on what is important for you. Simplify your life and really focus on what is important. Let not the distractions of your world occupy your mind. Work on yourself and your destiny and you will see the changes you desire. Be patient with yourselves and each other. This is a time of great learning and expansion, so take the time to learn, study and gather the knowledge that you seek to help you confidently move forward. This is a time of great growth and change. Old energy may feel threatened by your light. Know that you are safe, supported and protected. Know that you are healing and can send them back love and release any thoughts that make you feel less than. This is a time of emotional healing and this enables you to open your hearts to more love. Release any anger, fear, or unforgiveness from your heart, your mind and your body for you no longer need to wear these scars of the past. Take action as you feel guided. As you get better in touch with your truth and authentic self, you will know what to do and what is best for all. What is best for you is what is best for all as you are all intrinsically connected to each other. As you do to yourself, you do to another. As you do to others, you do to yourselves. Trust your inner guidance. Assert yourself with love and wisdom and remember that it takes a village to raise a child and that is truly what you are. Take the time to connect to your inner awareness and you will feel the guidance and direction you seek and trust more confidently in your dreams and yourself as you take your steps up the ladder of ascension. I AM Serapis Bey and I am honoured to guide you at any time you desire for an initiation to raise your vibration. Sharon Taphorn, author of Angel Guidance: Messages of Love and Healing, is an international teacher, healer, author, mystic, and Earth keeper. She shares her wisdom, spirit, and passion around the world through her books, radio programs, articles in the Sedona Journal of Emergence and Beliefnet.com, daily messages of Angel Wisdom, and workshops on healing, empowerment, and expansion. 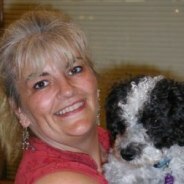 Sharon is a gifted intuitive, empath, and sensitive. She has worked with these gifts since childhood. Sponsor a workshop with Sharon, the Angels, and Masters. You can visit her website at www.playingwiththeuniverse.com.